The Tower Museum and the Guildhall are to throw open their doors this weekend, September 12 and 13, as part of European Heritage Open Days, along with more than 400 other venues across Northern Ireland. The weekend offers the opportunity for people to explore the historical gems right on their own doorstep and join in a free celebration of heritage across the country. Mayor of Derry City and Strabane District, Councillor Elisha McCallion, is encouraging local people to get out and about and explore some of the hidden heritage treasures scattered throughout Derry and Strabane. “When it comes to heritage, Derry has a fascinating story to tell, and so many beautiful buildings to explore, including our 400-year-old Walls,” she explained. 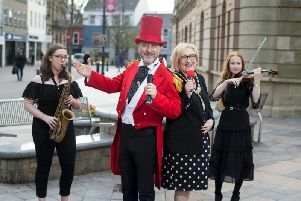 Michelle Murray, Derry City and Strabane District Council’s Visitor Services Manager, said she was delighted at the opportunity to showcase both the Tower Museum and Guildhall as part of the celebrations. “So many of us know more about the history of the places we visit on holiday as we make a point of visiting heritage sites and exploring visitor attractions,” she said. “But we often overlook the fascinating historical artefacts and architecture right on our own doorstep. More than 400 buildings and monuments will open across Northern Ireland on Saturday and Sunday, including The Playhouse, St Augustine’s, Ashbrook House, Prehen House, The Museum of Free Derry, St Eugene’s Cathedral, and other buildings of historical significance, as well as free tours of the Walls, Ebrington Barracks and the Shirt Factories.